Lunch was leftover rotisserie chicken and rice pilaf from a box. It's not all that healthy or delicious when I think about it, but I have warm nostalgic feelings from eating it frequently in college. I didn't have any veggies cooked so I supplemented with a salad from the office caterer--romaine with pears, walnuts, dried cranberries, pear vinaigrette, and a little goat cheese. In the afternoon, there was a baby shower so I had some chocolate cake with banana filling--yum! Dinner was a new recipe: Apple Soy Roasted Salmon. 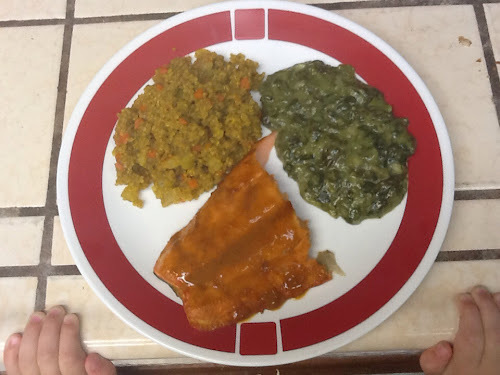 CJ (the husband) marinated it for an hour or so before I got home and then we threw it in the oven, some quinoa pilaf on the stove, and pre-packaged creamed spinach in the microwave. The one snag was that CJ mixed up tamari (soy sauce) with Sriracha [he had never heard soy sauce called tamari before so he guessed], so there was almost ten times the chili flavor there should have been in the marinade! I added more tamari as soon as we discovered the goof, and when I reduced the marinade to a sauce I added a big splash of coconut milk to temper the heat. The final product, with toddler fingers ready to climb up and grab it from the counter! 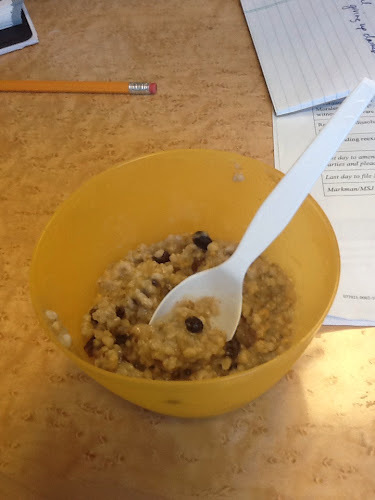 Everything turned out pretty well, especially considering the recipe mixup! We'll have to try it again with the correct proportions of spices. CJ redeemed himself by suggesting piña coladas for dessert to cool our tongues! Boil the apple juice in a small pan until reduced by half. Set aside to cool. Stir together the cooled apple juice, tamari, sesame oil, agave, garlic, ginger, and chili paste. Pour the marinade over the salmon and refrigerate for about an hour. Before roasting the salmon, pour the excess marinade off the fish into a small pan. Bring the marinade to a boil over high heat and cook until reduced by half, about 7 minutes. Place the salmon in the oven for about 7 minutes. 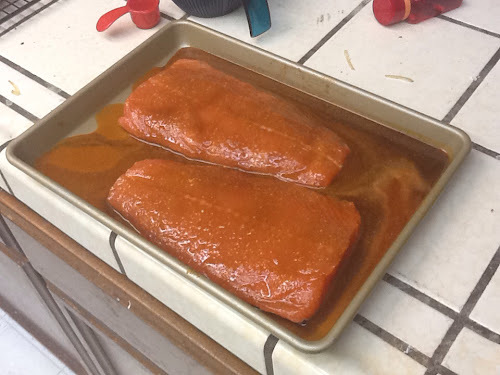 Brush salmon with reduced marinade and continue cooking until golden brown and cooked through, about 7 more minutes. Before serving, brush again with marinade and garnish with scallions and lime wedges. 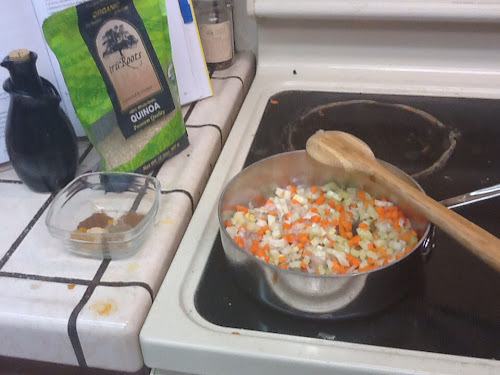 Heat olive oil in a saucepan over medium heat, then add shallots, fennel, and carrot, plus a pinch of salt and sauté until the vegetables start to sweat, about 3 min. Stir in the quinoa and spices, then stir in the broth and 1/2 tsp. salt and bring to a boil. Lower the heat, cover, and simme for about 20 min., until the liquid has been absorbed and the quinoa is tender. Fluff with a fork and add fresh herbs before serving. Ooooh, this is great because I love salmon and eat it often (benefit of being from Seattle), and I need more ways to prepare it.